NSW Archives - Page 7 of 7 - Adventure, baby! 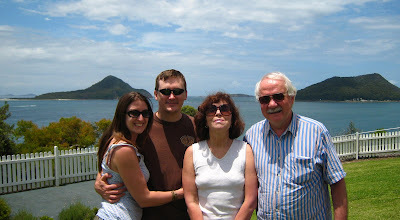 Port Stephens Holiday – More! A mini vid I took at Fingal Bay, Port Stephens. And a panorama pic I took from the tea rooms. After a leisurely breakfast, Alec and I checked out of the hotel. We went to lunch at the Inner Light Tea Rooms with Lisa and Alan before heading back to Sydney. The tea house is on the site of the old light house and has amazing views of the bays. Lisa and Alan and their root beer spiders. This little fellow caught a worm right at my feet. Having people around didn’t bother him in the slightest.